As the baby elephant peered out from under it’s mothers belly, the rest of the herd jostled with each other for space at the waters edge. I switched the video camera off and looked up. In the blink of an eye the boisterous baby had darted into the herd, turned, slipped on the wet clay surface and fallen into the waterhole. What ensued was a dramatic rescue which would take 9 minutes for the mother and an aunt to assist the struggling elephant safely back onto dry land. Undoubtedly, this riveting scene was to pave the way to a passion for the Addo Elephant National Park in the Eastern Cape of South Africa for both Amanda and I. Watch video here. 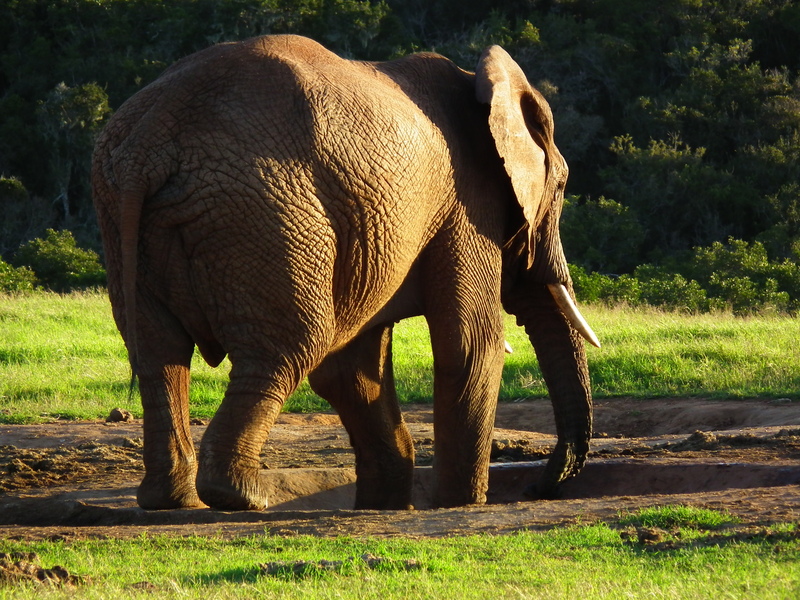 A two and a half hour drive from our home in the Garden Route, Amanda and I have returned to Addo on numerous occasions when the call for wildlife courses through our veins. Touted as the home of the ‘Big 7’, Addo National Park, in addition to the terrestrial ‘Big 5’, also boasts whales and Great White Sharks within it’s boundary. Yet, it is not the population of elephant, the graceful Kudu or the delightful Warthogs that instigates our regular visits to the park. Instead it is the proximity of a primal landscape and the experience of excellent birding that draws us. Game viewing in the reserve is not easy. The vegetation is dense with a myriad of game tunnels burrowing through it. Yet, as you meander along the network of roads the abundance of wild life is evident. A multitude of Scarab Beatles roll balls of elephant dung to nursery burrows while yet more fly in search of fresh dung. Of which there is no shortage in the reserve. 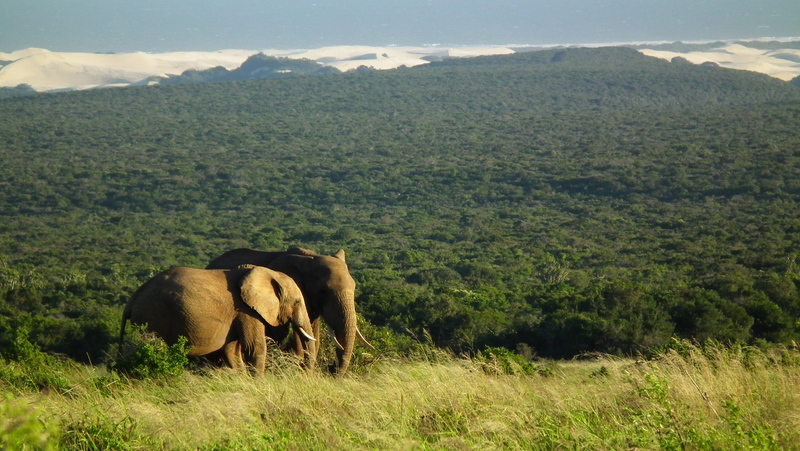 With a population exceeding 300 elephants, the reserve has the highest density of elephants in the world. With the average elephant consuming a daily intake of 150kg of food, there is the making of plenty of dung dotted around the reserve, more than sufficient to fuel the bountiful dung beetle population. Cruising slowly towards the interior of the park, all but the largest SUV’s are dwarfed along the roads by the wall of trees and shrubbery. Yet gradually, as ones senses attune to the surrounds and a slight movement is perceived which on closer inspection betrays a flicking ear besides a spiralling curl of Kudu horn. Then suddenly you perception is filled with the entire beast. Next, a second one seemingly emerges from the shrubbery and before you know it you are surrounded by a herd of between 10 and 15 of these graceful herbivores. Moving on towards one of the numerous water holes, your journey is punctuated by the antics of Warthogs as they erupt from one tunnel to bolt across the road only to dive down another tunnel. Others graze earnestly, kneeling down with swishing tails on grassy verges indifferent to cars and cameras. Most comical are the piglets frolicking around with impatience between the adults, their tails like tufted aerials held erect. As the parks name would suggest, if it is a herd of elephant you wish to see, you will not be disappointed. You may have to exhibit patience as a bull and his Askari’s saunter along the road, tranquilly plucking branches and leaves from the shrubs lining the road. Bull elephant dominating a waterhole. Irrespective of your expectations, your encounters with the elephants will be varied. Young bulls can frolic for hours in the larger waterholes like Harpoor Dam, Rooidam and Domkrag Dam. The conduct of breeding herds, which are comprised of a range of juvenile elephant’s and sexually mature females, are ordered while waiting for access to the dams but soon unravel to exuberant mayhem of slurping, jostling and gentle grooming once the matriarch communicates that it is safe to approach the waterhole. Then, in response to a sub-sonic signal the herd gathers, saunters into the bush and vanishes leaving you questioning whether you had merely imagined the chaotic display that consumed you entire attention. Travelling south you traverse a variety of habitats with enticing ‘loop’ routes splintering off the arterial road. One of our favourite loops is Harvey’s Loop. Entering the southern end of the loop you depart from a huge grassland on a vivid red gravel road and rapidly pass through distinct vegetation transitions. Early morning or late afternoon the hillside reverberates with birdlife, and it is to here that we navigate to on each of our visits. Parked with the windows open, a cacophony of bird song enriches our visual senses. 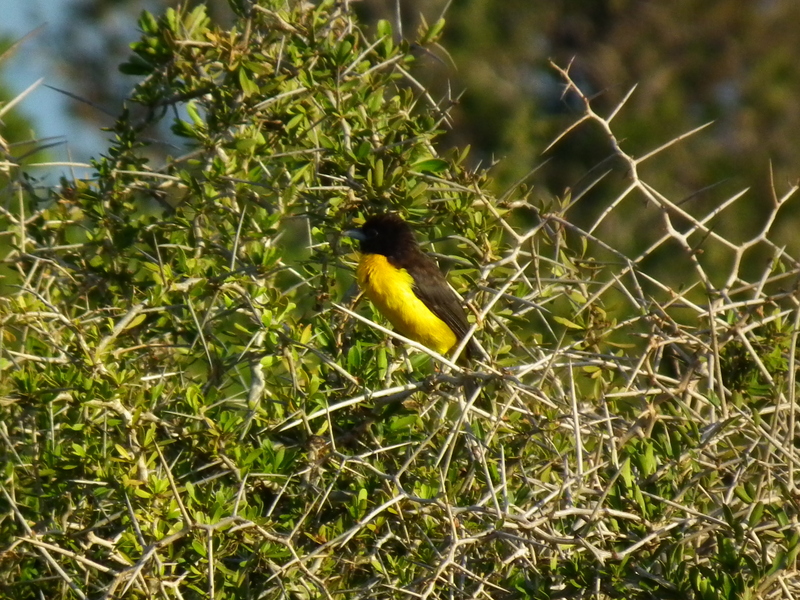 Dark-backed Weavers trill while Karoo Scrub-robins spit at each other. White Browed Scrub-robins serenade invisible mates while Mousebirds harvest berries. In ten minutes we can record over 25 species, all flying along a crisscross flight path into the midst of shades of green cloaking the slopes. In the evenings, as embers of the braai fire near perfection for cooking we settle down for a sun downer from the view deck at the Spekboom camp site and reflect on the saturation of experiences of the day of game viewing and bird watching. Seductively the night chorus lulls us to sleep with dreams of what we will encounter from the break of dawn tomorrow. Be Prepared to be Safe when hiking in South Africa. 72 Hours in Cape Town. Whale Strandings – the harsh reality of nature.